In a normal situation, dental emergencies are more painful than they are medically serious. However, when SHTF you need to be able to handle minor dental issues on your own to prevent infections or diseases. When you have gum disease, bacteria from your mouth may enter your bloodstream. This produces a protein that makes your blood thicken, meaning clots are more likely to form. If your heart doesn’t get the nutrients and oxygen it needs, you have an increased risk of a heart attack. You may face various kinds of dental issues when disaster strikes, but the items in these kits should help you address them. This kit contains common items that can treat many basic dental emergencies. Keep this in your survival gear at all times. Gloves – Keep a pair of medical gloves in your kit. You can also use a pair of thin gloves. As an added precaution, use vinyl gloves instead of latex gloves which may trigger a latex allergy. Light source – You’ll need a light source, like a candle, flashlight, or the sun, and a small mirror so you can properly see the wound you are trying to treat. Salt water – A salt water solution is a simple yet effective antiseptic and antibacterial. This can be used to wash out any wound with or without debris. Make this at home by adding several tablespoons of salt to a tall glass of water. Mix well. Small mirror – If you don’t have a small mirror, use a clean spoon to get a closer look at the wound. Never use a shard of mirror because you could cut the gum or cheek by accident. Toothbrush – Keep one toothbrush in your dental emergency kit. Stock up on extra toothbrushes because you don’t want to run out when SHTF. This kit adds more items to the basic kit detailed above. You can find these extra items in local shops. Alcohol wipes – Alcohol wipes come in individual packets, and you can use them to clean the affected area. Cotton balls – Cotton balls are multi-purpose items that can be used to plug bleeding caused by a knocked out tooth. Cotton balls can also be soaked in liquid pain reliever and applied directly to an exposed root, or you can use them to provide a barrier between a broken tooth edge and the inside of your cheek. 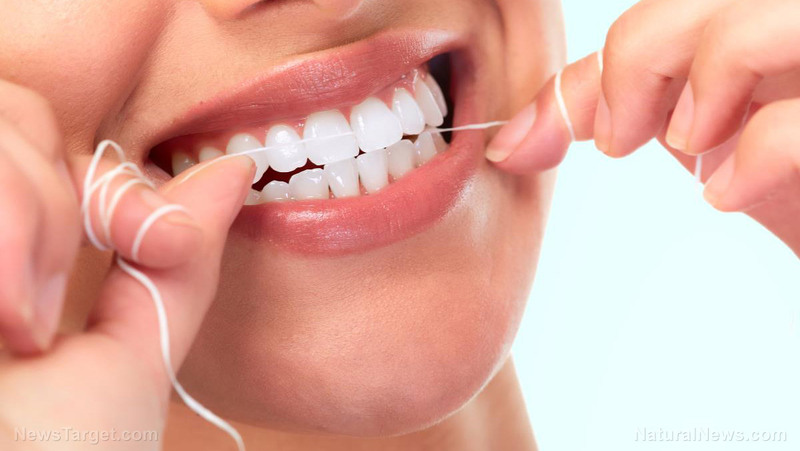 Floss – Flossing is just as important as brushing. Flossing removes food that may get stuck between your teeth. Gauze – Gauze can be used to plug bleeding. Buy gauze in a sealed packet from a pharmacy or drug store to prevent infection in your mouth. Ibuprofen or paracetamol – When SHTF, you won’t always have spare time to create natural remedies. Use painkillers like ibuprofen or paracetamol sparingly. Always read the package, and don’t take more than 4 g of paracetamol a day. Vaseline – Use Vaseline to cover exposed nerve roots and empty fillings. If your tooth has fallen out and you want to take it to an emergency dentist to have it refitted, store the tooth in some Vaseline. The mixture will prevent the tooth from “dying” while you wait for reinsertion. This kit includes everything from the previous two kits, along with some harder-to-find and more expensive items that can address more serious dental issues. Clove oil – Order clove oil online or buy it from the local drug store. Clove oil has a very strong taste, and it contains active compounds that can treat nerve and tooth pain. Since the oil has a low side-effect profile, it’s safe for almost anyone to take. Dental wax – Use this wax to coat braces or the sharp edges of broken or fractured teeth. Disposable cold compress – Use a disposable cold compress to reduce swelling, pain, and further damage to your tooth. Hydrogen peroxide – This is a stronger antiseptic compared to salt water or alcohol wipes. Read the instructions first before using hydrogen peroxide, and never swallow the solution. Temporary filling – This paste may be more expensive than other items in your kit, but it is a life saver. Use this if your filling is knocked out, which may expose the tender root underneath. Exposed roots will cause pain, but using a temporary filling will offer almost instant relief. Tooth solution – You can get tooth solution from a dental or medical center. A tooth solution is a vial of salt water that has the same salinity as your body. Using tooth solution increases the rate of a tooth being re-implanted successfully. Keep in mind that you only have a couple of hours to have a tooth planted. Topical anesthetic – Like the painkillers in the intermediate kit, you need to use a topical anesthetic sparingly. While a topical anesthetic offers immediate relief, it is also very short-acting. Take note that the information in this article is no substitute for professional medical care. Visit SurvivalMedicine.news to read more tips on how to maintain oral care when SHTF.